Before heading to New Orleans, I had a short list of things I wanted to do, some through recommendations from my friend Anne, a New Orleans native. She told me about the Audubon Butterfly Garden and Insectarium, and I just had to go, especially after I looked it up online and found out that on Wednesdays you could talk to an entomologist. I had it in my head that this would involve a lecture on cockroaches, complete with an auditorium and wooden seats, just like in college. I wasn’t prepared for how the museum was geared toward kids, and all the…well, kids. I walked past and a giant spider popped out of a trapdoor, and we all screamed together—in good fun, though, not like the little girls’ hissy fits. 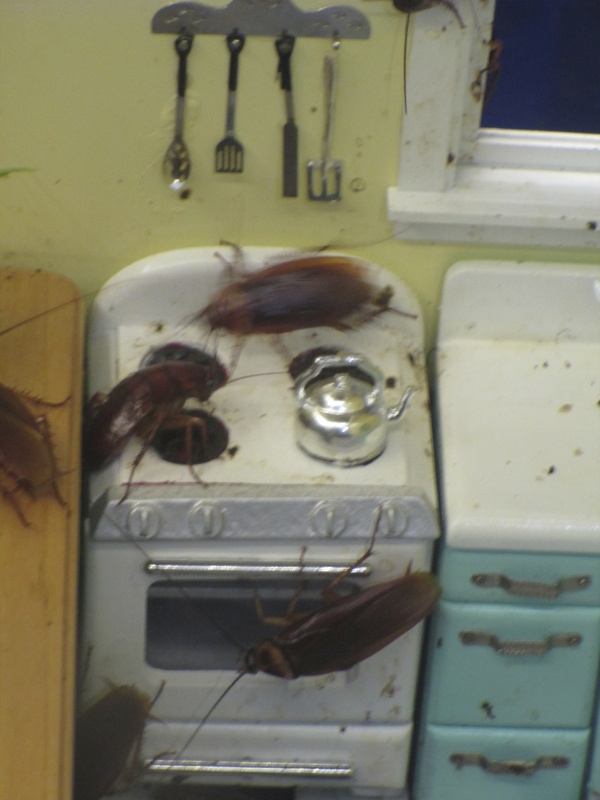 I ended up being a little disappointed in the cockroach house, complete with cockroach cam. I really thought it would be a lot bigger and more informative, but the pictures I took turned out nice, so I’ll console myself with that. 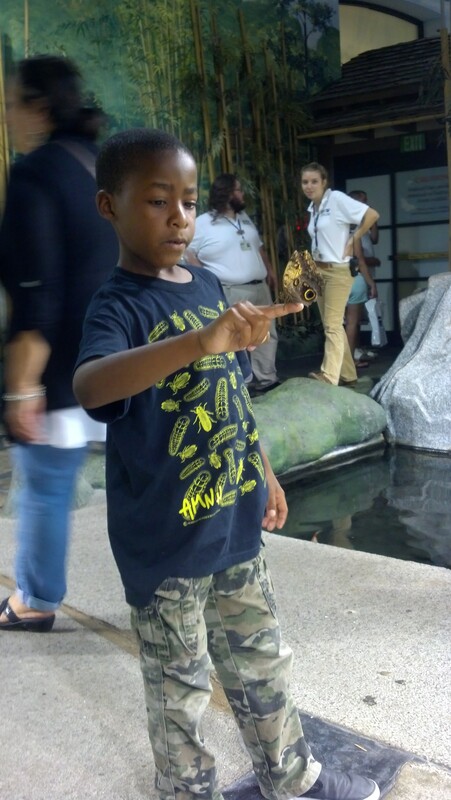 As we walked through the different rooms of the insectarium, we would run into somebody on the staff every once in a while who asked us if we wanted to touch a millipede or pet a beetle—why, yes I do!—but I didn’t realize until we were in the last room that these were our entomologist chats. It was ungodly hot in New Orleans. Every day the temperature was more than ninety degrees, but with the humidity factored in, it felt more like one hundred. The locals told me, “You ain’t seen nothing yet. Wait till August.” In a constant state of sweat, I only got a break when we were in the air-conditioned rooms of the Dauphine House or in museums or restaurants. At the same time, it was very purifying, sweating all the toxins out during the day so I felt ready to sin at night. We found the streetcars an effective way to stay cool, whether they were air-conditioned or the breeze was generated by the motion of the car. 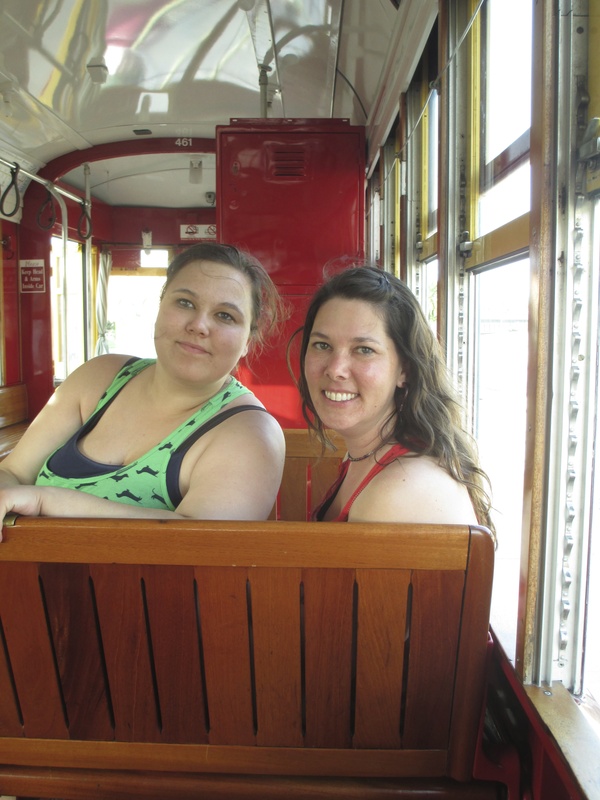 In the St. Charles streetcar, all the windows were open, including the driver’s front window, so he could talk directly to the police when we were stalled in traffic. We passed by a movie set, and somebody asked a security guard what was filming. The lady was obviously on her break but politely said, “Hot Tub Machine 2. This time they’re going to the future.” The passengers on board looked for stars, and we saw one actor in a blue spandex and duct tape costume, who somebody identified as Bradley Cooper. We checked the movie’s IMDb listing when we got back to the Dauphine House and he didn’t appear in the cast list, so now we’re going to be mystified until we see the movie. 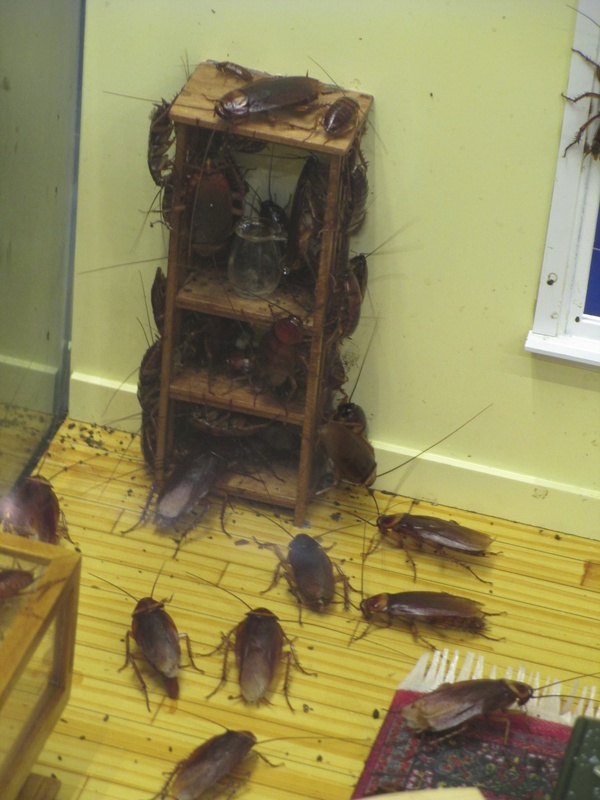 The same friend who told me about the insectarium also recommended the Honey Island Swamp Tour, saying that was the best one. 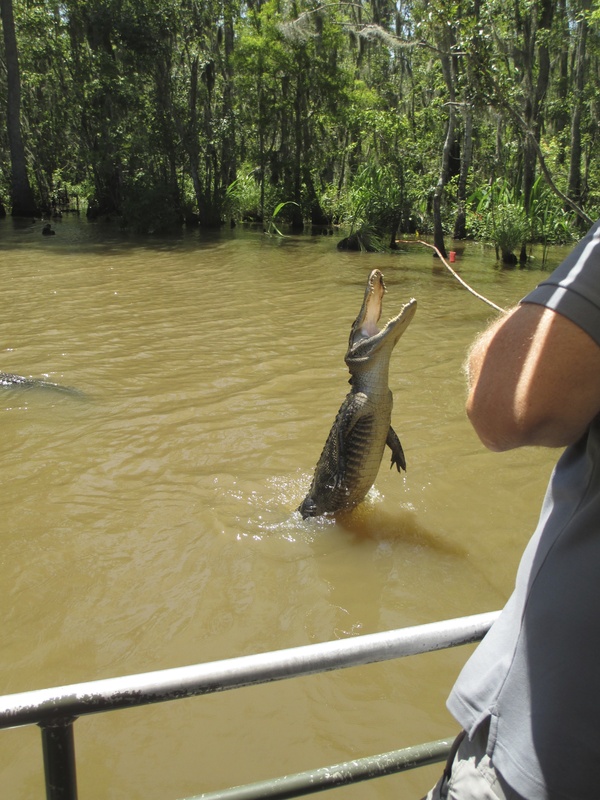 I was really looking forward to this—the swamp tour being the highlight of my New Orleans trip the last time around. There’s something about being on the water that calms me like nothing else, and this tour was two hours long. Sarah’s daughter Megan made the reservation for us and had some trouble understanding the guy on the other end of the line and making herself understood. I got it the next day when an elderly man pulled up to the Dauphine House twenty minutes late for our scheduled departure. He said, “You gave me the wrong phone number. Your phone don’t work.” This was after we called to see what was going on. Our pontoon boat was full, and the tour guide (different from the van driver) joked, “It seats twenty-four people or twenty Lousianans.” I got one of the backseats to myself and was glad because I’d completely hosed myself in Off! and had a chemical funk going on. The guide said that because of all the dragonflies, there weren’t many mosquitoes in the swamp during the day, but come nightfall, when the dragonflies were dormant, there would be swarms of them. We started off slow, going through muddy water that looked so much like the chocolate river from Willy Wonka and the Chocolate Factory and passing a few swamp cottages. 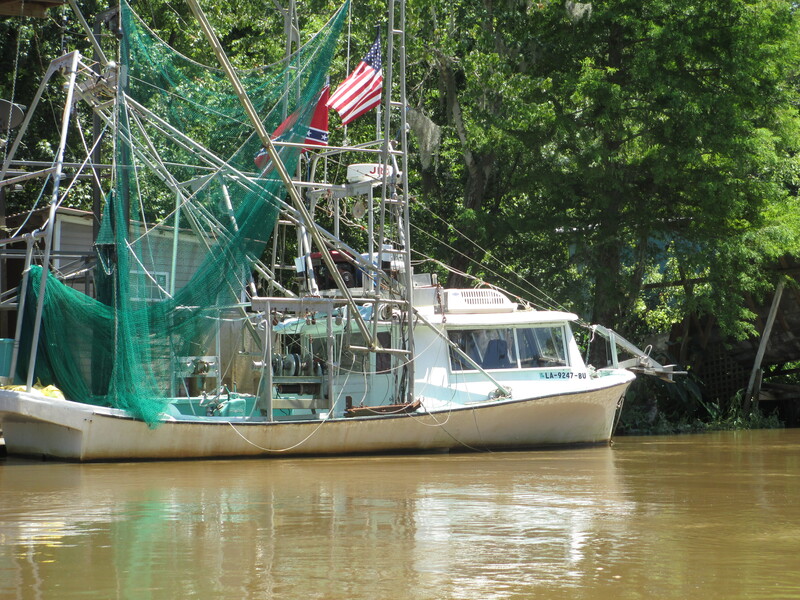 I was disturbed by more than a few Confederate flags that were flying out in front some of these residences or on boats. I guess for some people, this flag represents Southern pride, but I always think of it as a symbol of slavery. 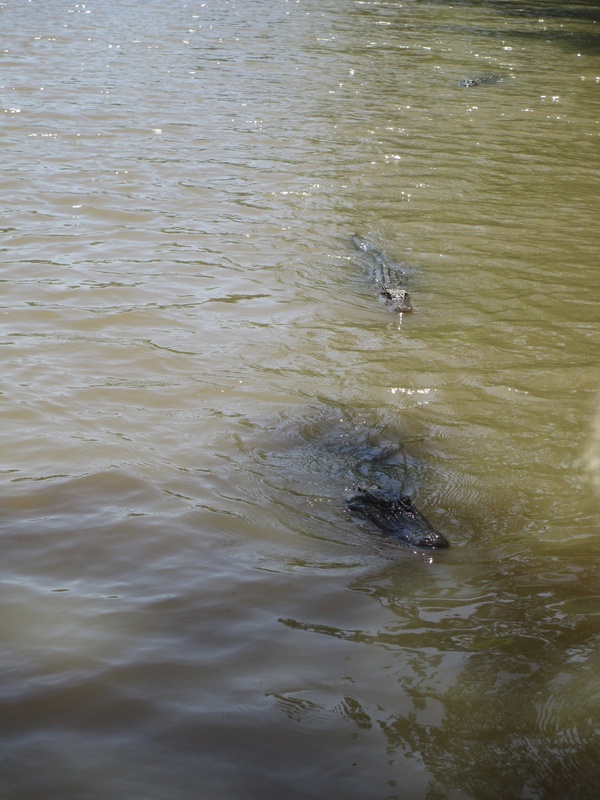 About ten minutes into our tour, the alligators started coming up to the boat. They’re well trained and know the boats are bringing them treats. The tour guide had a Styrofoam cooler full of hot dogs and marshmallows. When the gators got near the boat, he’d put a hot dog on a stick and dangle it above the alligators’ heads, making them dance for their suppers. He knew them all on sight and had names for most of them; there was Broke-Jaw Betty, Big Boy, and Elvis, a little four footer named such because he was a particularly good “dancer.” The tour guide said he had grown up in the area and swam in the swamp all the time. The alligators never bothered him, and the way he fed them and talked to them, the Honey Island gators seemed more like water dogs than a menace. When I asked about the Honey Island Swamp Monster, he scoffed, saying it was supposedly what happened a while ago when a chimpanzee mated with one of the alligators. I’m guessing that one was dreamed up for PR. The Honey Island Swamp is really beautiful. 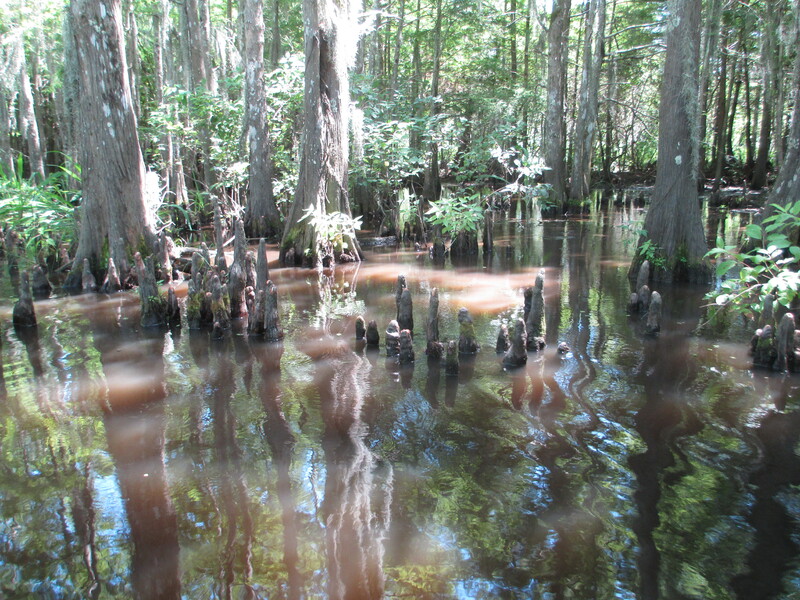 About an hour in, we came to the most gorgeous part of the swamp, where the trees’ roots come out of the water, looking like red and brown stalagmites. The air was humid and everything felt thick and wet and slowed down. The water’s ripples even turned slow and wavy, and sounds seemed magnified. It would be easy to maybe see a monster in these conditions. This area was where the wild boars sometimes appeared, but when the guy called, they didn’t come. Probably too full of hot dogs and marshmallows from the last tour group.